What is the best way to monetize 150 small IG accounts running on JARVEE? well i am thinking to start monetizing these 150 IG small accounts i have running on JARVEE and i am thinking to build a general dropshipping store and start using the contact tool to send them a coupon code with 10 or 20% off for thier first purchase and i am ganna send like 50 dms for each account . so guys please let me know your opinion about this and what would you do if you are in my position ? 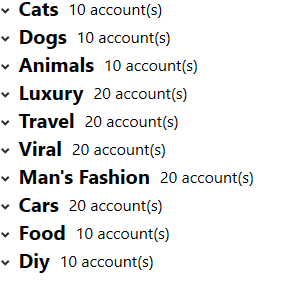 Depends on what niche are your 150 accounts in. I would try to make a store that is related to your 150 accounts niche in some way rather then just a general drop shipping store. Also the coupon idea is a good one. Don’t forget to also collect their emails. You have 150 accounts, but you haven’t told us the niche. You need one of the CPA gurus here. Since the niches are so varied, it sounds like a T shirt drop shipping store would be the best bet. May I ask why you picked so many different niches? Imo 1-2 niches would be better for monetization wouldn’t it? grow them until 10 or 20k and sell them. keep on adding new ones to have a steady income after 2 months. Here’s what I would do if I was after short term money (possibly long term if you automate all the process) : convert them all to adult niche and see the money flow in. Long term the growing to 10 k and more then selling works well. @Biko is a muslim like me , we cant make money with unethical ways . i can help you with designing your store with shopify for free . convert them all to adult niche and see the money flow in. Would you kindly explain how one would make money in this niche? I am very much like @Biko here - with varied niches. But I have read multiples times on this forum about the money making possibilities of adult niche.